Foods that are calorically dense offer the most of highest number of calories, or energy, in the smallest amount or serving size. To make the top 10 high caloric density food list, the food item should offer health benefits, in addition to calories. Foods obviously rich in calories include fried foods, pure fats (like oil, butter, and lard), and fatty and/or sugary desserts, such as cheesecake. The following 10 high-calorie foods are also healthy foods and may surprise you. 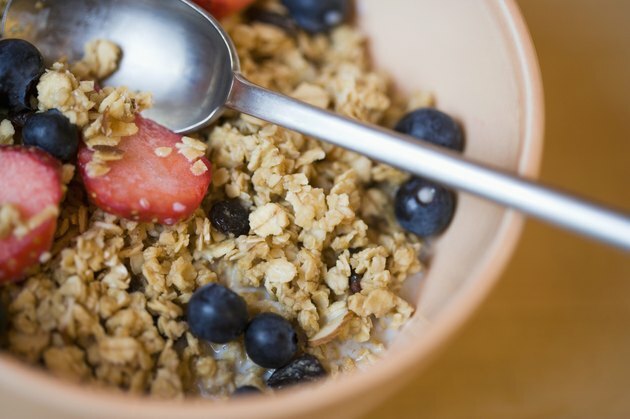 Ready-to-eat breakfast cereals are usually low in calories, but add in sugar and fat, especially with a high-calorie cereal, such as granola, and you may be in trouble. Although considered a fiber-rich whole grain, commercially prepared granola, with nuts, has more than 500 calories per cup. Cheese, including goat cheese, is an excellent source of calcium, providing 25 percent of the recommended daily value (DV) for this mineral per ounce. However, it is calorie-rich. A 1-oz serving--about the size of two dice--of hard goat cheese has nearly 130 calories. Nuts are nutritious, and offer heart-healthy unsaturated fats. Dry-roasted macadamia nuts are an excellent source of iron, as well as B vitamins and other nutrients. However, they are calorically dense. A 1/2 cup of halved nuts provides about 470 calories. Almond butter is one of several popular nut butters (peanut butter, from a legume, is the most popular). Almond butter is a good food source of magnesium and manganese. A small serving, 2 tbsp., offers about 204 calories. An avocado is a fruit. It is the highest calorie fruit in existence. One whole avocado, of any variety (about 7 oz.) offers 325 calories and 30g of fat. Nearly all of the fat is monounsaturated, which is heart-healthy. Avocados are an excellent source of vitamin C and dietary fiber. Commercially prepared smoothies, made from juice and fruit, are vitamin-rich, but can be high in calories from sugar because they are usually juice-based. You can keep the calories in control if you are careful. Otherwise, expect to consume more than 350 calories (on average) for a small,16-oz. smoothie. Peanuts are a legume, not a nut, despite the name. Like nuts, they are rich in calories and many nutrients. A 1/2 cup of dry roasted peanuts provides about 425 calories, making them calorically dense. On the plus side, peanuts are rich in iron and unsaturated fats. Banana chips are not really a fruit, but a high-calorie snack. While they are a good food source of nutrients such as manganese, potassium, magnesium and vitamin B6, a 3-oz serving of banana chips offer nearly 450 calories, and more than a your entire day's limit for saturated fat. Dried fruits are naturally high in calories because the sugar content is high and the water is removed. For example, a 1/2 cup of chopped, pitted dates offers 251 calories, 1/2 cup of raisins over 217 calories, and the same amount of dried figs offers 248 calories. All are rich in fiber and iron. Commercially prepared muffins, or muffins from a bakery, offer vitamins and dietary fiber but typically a lot of calories and fat because they are so large. A bran muffin from a bakery (about 3.5 oz.) offers more than 300 calories and 10 grams of fat.